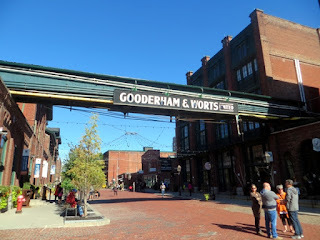 This past weekend we took the time to do something we've been talking about for at least ten years, and possibly for all twelve since it became a thing one could do: we strolled over to Toronto's Distillery District. You might have to click on this to see the creepy giant red eye. A brief history: in the early 1800s a mill opened in Toronto and sensibly added a distillery to take advantage of the plentiful grain being grown in the area. 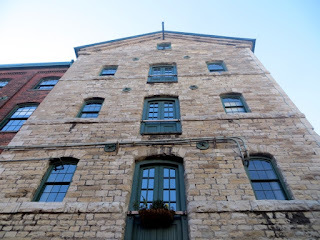 The distillery was a huge success, go figure, and survived many a hardship (including fire and also Prohibition, which was shorter in Canada than in the U.S. but still... the business had to have taken a hit) for about 150 years. 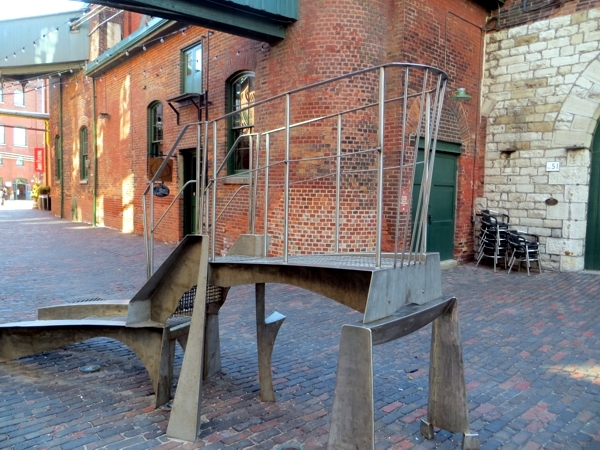 After that, the site became incredibly popular as a movie set, and since 2003 it's been a pedestrian playground for art studios and galleries and a really interesting shoe store. 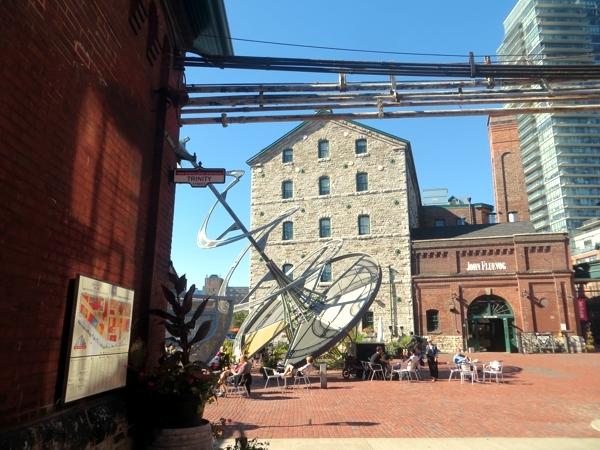 The Distillery District is one of those cool places you try to see as a tourist, but may not get to as an old married couple disinclined to go that far to meet friends for drinks and dinner. At Christmastime there is a market I will totally visit this year while we are downtown, but haven't before, because I hear it's expensive, and you can't easily find parking there, and it's about a 25 minute walk from the nearest subway station so it's subway and streetcar instead, and Meh. I can't be bothered. This year, though - well, we are a 17 minute walk from it here at the condo. And on our holiday Monday the weather was clear and sunny so going there was the Right Thing To Do. 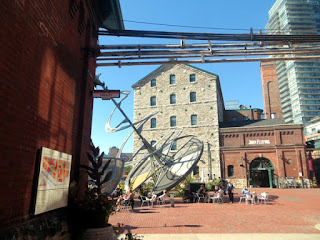 We walked along The Esplanade, a street I've been down about a block of, which isn't far enough to find out that the little park on one side stretches all the way along, block after block, to the entrance of - you guessed it, The Distillery District. 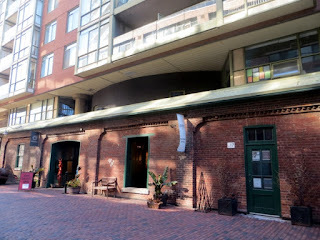 There is a lot of brick in there, some of it integrated into new condominium buildings I immediately priced units in on our return home because Condo. 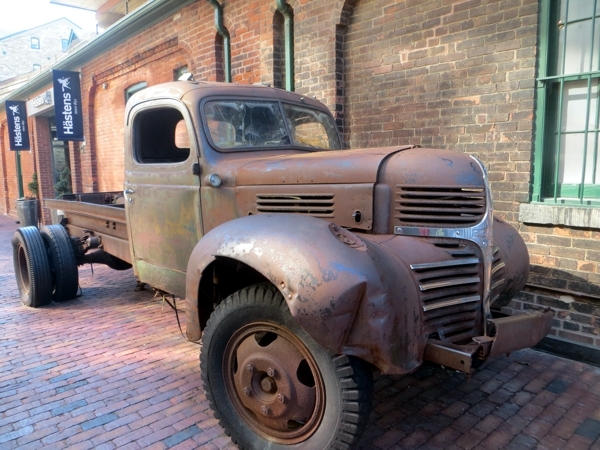 And also, a few old trucks. 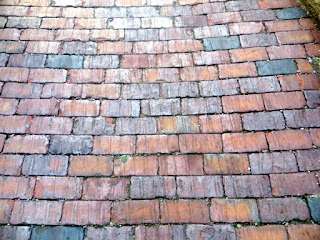 Did I mention the brick? Let's take a closer look. The other one is bigger, and needed this very attractive support to keep from tipping over. Some of the buildings are made of stone, which is always appealing to me because I looooove rocks. 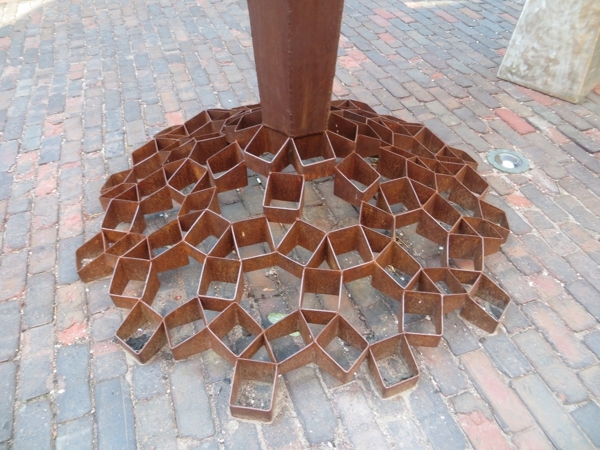 And symmetry. Technically, I enjoyed our visit - it was a gorgeous day, and the setting is beautiful. If I were wealthy and on vacation I would have bought artist-produced jewelry or pottery or clothes from one of the independent designers' shops. If I was a real art hound I would have enjoyed lingering at the studios too, I'm sure. If I hadn't been wearing boots that are still very hard to take off without my boot jack (I really hope they soften up some day) I might even have pined more productively for the gorgeous shoes in the shoe store. It's in the low building on the right, below. But sadly, I was just hungry. There is a Greg's Ice Cream there - only the best ice cream ever - but it was closed that morning. Also there is a coffee shop Pete likes because it's so cute, but it was once again sold out of croissants. Seriously: every branch of this place we go into, it's sold out of croissants. They are always on the menu, and never on the counter, and I am pretty sure I am going to start putting my foot down about going in there because Harumph. 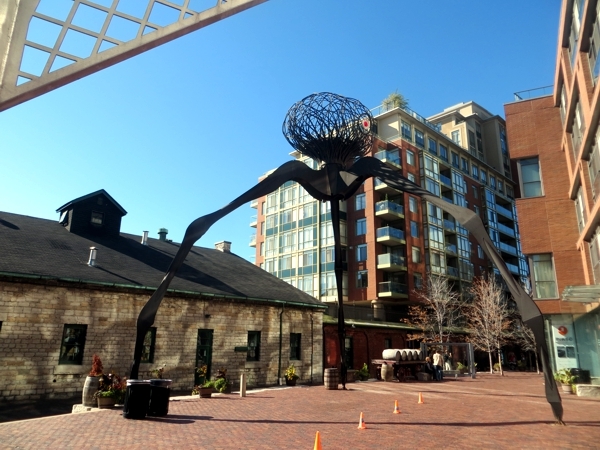 You know what else is in the Distillery District, though? Right at the end of one road, it turns out it has a really, really good bakery. Twenty minute stroll, aromatic bakery with fabulous fresh bread and sandwiches and desserts. Who cares if I can't afford anything else over there? I would so be making that trade again. Except that when I hunted up that link, I checked for other locations and Omigosh, there is a much nearer one across the corridor from the nice grocer's I visit nearly every day on my way back from the subway, and which I have actually tried out, and never returned to because the chocolate brioche I ordered was kind of mediocre. Did you discover anything new and exciting this week? I love all of your pictures - my favorite being the one of the bricks! 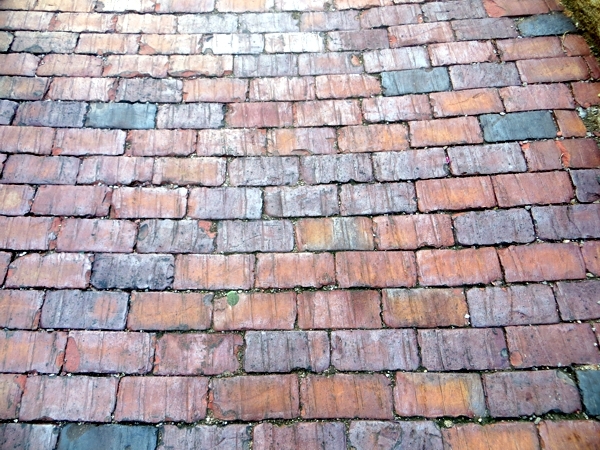 I'm very drawn to old bricks when I'm out and about. 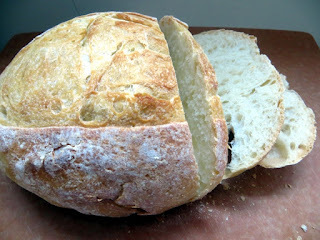 That bread - looks so yummy I can almost taste it! I discovered this week that so many of my neighbors (and I) have all had Lyme's disease at some point in the past several years or so. Not a fun thing to discover - LOL! Oh no, not Lyme Disease! Especially undiscovered Lyme... the ticks where are cottage is are infected with that and we are having to be very careful but the word is that if you treat quickly the condition doesn't take hold. I'm so sorry that's happened to you but thank goodness you found out at all!